Autumn is a great time of year for sowing new grass seed and for over seeding existing grass, find out why with our helpful guide. We have reached the start of autumn and the nights have started to turn, we have also arrived at the perfect time of year to get our grass, grass seed, grass turf and gardens ready for spring and summer next year. 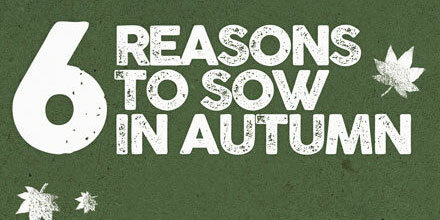 Here's 6 reasons to sow in autumn. We have created our infographic called 6 Reasons to Sow in Autumn showing you the benefits of seeding at this time of year versus what might be considered traditional. Have a look and see if we can convert you! Copy and paste the code in the box below to share this on your website.